It seems like it was forever ago that we finally found out the answer to the biggest question of all: Who is "A"? While most of us were disappointed to learn that it was, in fact Cece (a dark horse in the pool of candidates), it was even more disappointing to know that we had witnessed the summer finale of Pretty Little Liars and would have to wait until 2016 in order to find out more about our favorite Rosewood residents. High school love... is not forever, apparently. And, as to be expected, Spencer and Toby fell apart when she left Rosewood and he stayed there. He’s a cop, remember? Do you guys remember that time that Toby’s house blew up? Because honestly at that point in the series, the destruction kept piling up and it was hard to keep it straight. As a result of all of the chaos that ensued, Toby took the large sum of money and moved just outside of Rosewood. When he witnesses a robbery, he apparently meets a very important woman. Well, who is she? I need answers. Oh my God. Toby and Caleb go fishing on the weekends. It is adorable. Emily is not having the best five years. Apparently, Emily drops out of school because her dad dies. DID YOU READ THAT? HER DAD DIES. This is not okay. I’m not okay. Are you okay? And to add to all of this suspense and drama, it looks like Emily has a secret. Because, well, of course she does. And of course we don’t know what that secret is. The new episodes of this show haven’t even started airing yet and already there’s this intrigue. Go figure. Sibling bonding time!... Or not. We see a clip of Jason and Ali visiting Cece three months after the events at the prom. The visitations continue throughout the next five years. It’s through visiting Cece that Ali meets her fancy doctor husband, Dr. Rollins. In true Ali fashion, due to the nature of their meeting, it’s all secrets and white lies. Ah, don't you just love how television makes getting your work published look so easy? Interestingly enough, it’s her career that brings Aria back to Ezra... only in a working capacity. Down the rabbit hole, Ezra goes. Ezra has had a rough five years. He follows Nicole, from Habitat for Humanity, but that was apparently taken away from him really violently. He returns to Rosewood, broken and drowning in alcohol. It’s definitely a different kind of Ezra we’ll be meeting in the flash-forward than the one we were used to seeing. Cece, now going again by the name Charlotte, is getting better and hoping to soon come home. Ali reaches out to the Liars and asks them to come back to Rosewood and help her create a safe setting for Cece/Charlotte. The clothes maketh the (wo)man. The hair, makeup, costume, and music composing departments all wanted to give the show a more sophisticated vibe, as the girls are now five years older and no longer teenagers or children. I love this idea. Okay, guys. Remember how the moms were trapped in a basement at the end of the summer finale? Yeah... how they escaped is still a mystery. The actresses themselves don’t even know what happened! You’d think that through all of this, the show could have at least told us how the moms got out of that stupid basement. Sigh. Radley has become... a hotel. Wait, seriously? Yeah. Okay, sure. Who wouldn't want to stay in a place that used to be a mental institution? Whatever. That’s a choice. We do the girls sitting in the bar at the hotel together and I really hope that that’s going to play an important part in the new episodes. The Hastings women conquer the world. YEAH, YOU GO, MAMA HASTINGS. YOU TEAR CAPITOL HILL UP. The girls saying goodbye to each other before they went their separate ways was also the writers saying goodbye to the "A" storyline. 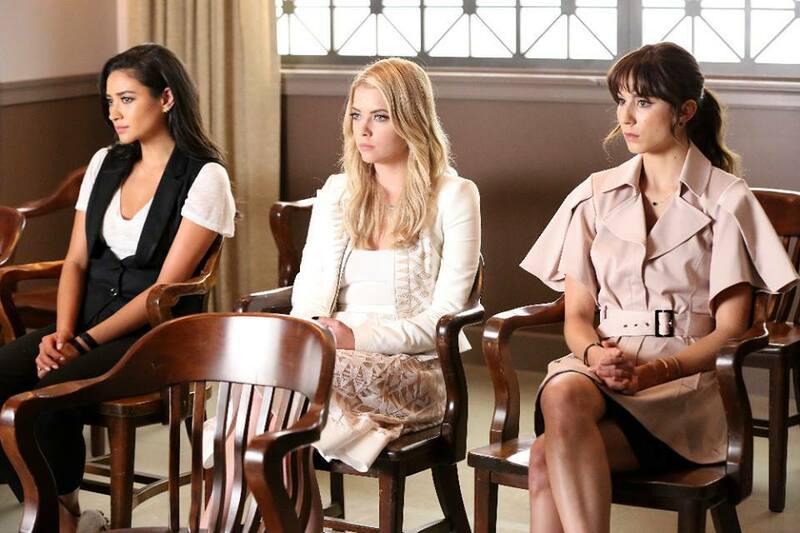 But the real question is: what will Rosewood even be like without "A" constantly tormenting the girls? Anyway, when the students leave, Mona is sitting in the back row. The two catch up on everything and everyone before Ali says exactly why Mona really is there: Mona wanted to work at the hospital in the same ward Charlotte is in, but Ali blocked her application. Apart from that, we learn more about Mona, which raises questions: what’s Mona’s job in the public eye? I need to know. Is she an actress? She’s always been so good at that. Nevertheless, Mona wants to see Charlotte and Ali won’t let her. She lurks in the corner while Ali makes a phone call and it makes me think that Mona is going to be up to something this season. Ali brings the girls back and she needs their help, but there’s something that happens that makes them all stay. Because of that, that’s where a new “Big Bad” comes about. There’s apparently something very dark and twisted about this one that’s much different than "A." You all know what this means... we're about to get back to our sleuthing ways! But this time, the Liars will be dealing with a brand new threat and a bigger threat than anything they have dealt with thus far. After the events of last season, I can’t imagine what could be worse, but apparently that’s what we’re going to be coming up against. What could possibly be worse than Mona and Cece? What could have happened to prompt someone to go after the Liars in such a way? Why do I have more questions than answers before season 6B has even started? We’re so close to the winter premiere and with all of this new information, we’re just going to have to sit and contemplate everything that could have happened in those five years that we missed. I’ll see you in January, my little Liars.